Ring News 24Boxing News Breaking Boxing NewsWill Errol Spence be the last man standing at 147 pounds? 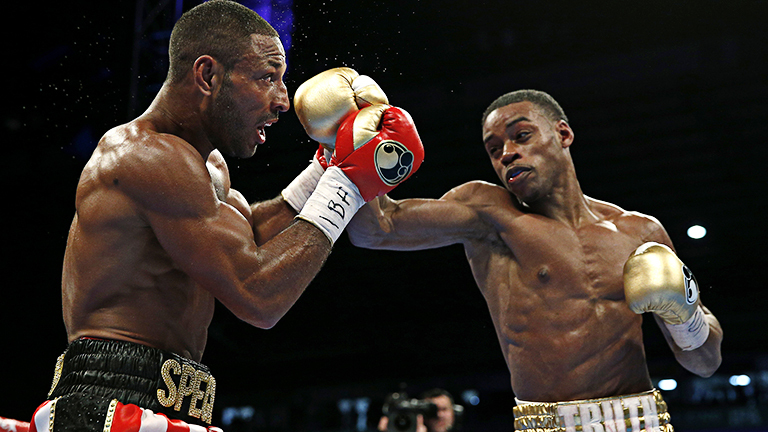 Will Errol Spence be the last man standing at 147 pounds? This past weekend, SHOWTIME CHAMPIONSHIP BOXING, Dallas, Texas native Errol Spence Jr. (23-0, 20 KO’s) delivered a sensational performance in halting a very game but outmatched Lamont Peterson for a TKO victory following seven rounds of action. Inside of the Barclays Center in Brooklyn, New York, Spence went to work and dictated the pace of the fight and never really allowed Peterson (35-4-1, 17 KO’s) to get into rhythm. Peterson, a former junior welterweight and welterweight champion from Washington, D.C., fought courageously, but wasn’t able to deal with Spence’s accuracy and power. Spence, a 2012 U.S. Olympian, out-landed Peterson 161-45 while connecting on 49% of his power punches compared to just 31% for Peterson. The always-classy Spence gave Peterson his just due afterwards, when speaking to SHOWTIME Sports reporter Jim Gray. If there was anything that Spence feels he needs to work on, it would likely be protecting himself on the inside, as the 28-year old feels he was touched a few times by Peterson. At the moment there appear to be two names who the boxing public would love to see Spence in the ring with: WBA/WBC welterweight champion Keith Thurman or former unified junior lightweight champion Terence Crawford. Each man represents a fantastic fight for Spence as well as the opportunity for him to continue building his star status. Since Spence and Peterson are both advised by Al Haymon, that specific matchup might be a little harder to make. Crawford is promoted by Bob Arum’s Top Rank. Thurman, however, has been far more reluctant. Keith did take to his social media handles after the win to congratulate Spence and give him his just due, but also noted for him to “be patient” a sure fire sign that he’s not rushing to look to make the fight. As for Crawford, it is a fight that makes sense, him and Spence, yet he has yet to face a full-fledged welterweight. Crawford will likely be facing off with WBO champion Jeff Horn on April 14 in New York, and that matchup will tell us a lot about his future at 147 pounds. Spence has also expressed an openness to face the likes of former WBC champion Danny Garcia and former IBF champion Shawn Porter, but neither fighter seems interested. We may have to wait a while to see if Spence is the last man standing at 147 pounds, but we do know that he won’t be going away anytime soon. Could the Alexander Povetkin vs. David Price winner be in line to face Anthony Joshua?